Emira lives in public housing in regional Victoria with her young son, Jack. At 27, she has faced significant challenges in her life: she left a violent family home at 14, and has since found herself in a series of abusive relationships. Originally from Bosnia, she now has no family in Victoria. She is not currently working and receives a Centrelink payment. Emira has significant debt, much of which comes from a previous relationship: she believes her ex-partner has incurred at least $30,000 debt in her name. Emira has also taken out loans and borrowed money from friends, and is paying off a court fine. Emira’s electricity was disconnected for five days in 2014. 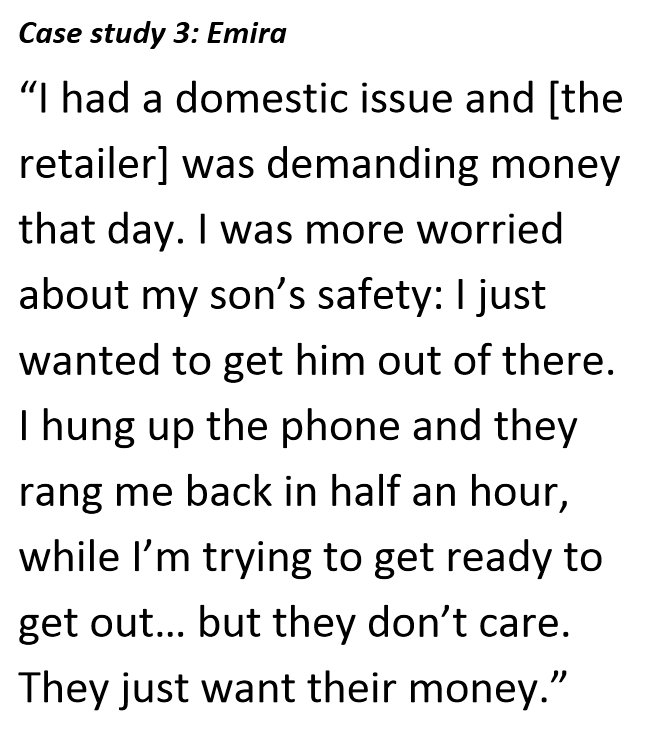 She owed about $1000 and her retailer, Simply Energy, demanded $480 up front. Emira paid $35 and was then disconnected. Emira says she had tried to negotiate a payment plan but Simply Energy insisted on $80 per week, which she could not afford. Emira sought help from St Vincent de Paul (Vinnies), who offered to pay $280 on her behalf; but Simply Energy would not accept less than $480. Eventually Vinnies paid $480 and Simply Energy agreed to reconnect Emira’s electricity the same day; however, Emira says it remained off for 5 days. Emira’s water supply and gas oven rely on electricity, so during the disconnection she lost those services as well. Emira’s son Jack was four at the time. Initially they spent time at a friend’s house, but it was not a safe place. Emira says a friend provided some food for Jack, while she went without. It was cold and they used blankets to keep warm. Emira worried about the impact on Jack. She was relieved to have Vinnies acting on her behalf, as Simply Energy was unsympathetic. Emira had switched her electricity account to Simply Energy through a door-to-door salesperson. She says at the time she did not realise she was signing up to a new retailer. Once she has repaid her debt Emira plans to return to her previous retailer who she still has her gas account with, and finds easier to deal with. At one stage, Simply Energy called while Emira was trying to escape a domestic violence situation. Emira says energy retailers could make it easier for people in hardship by being realistic.